We knew from the get go, that the German International School in White Plains would not have much garbage, as it is a cafeteria with all washable plates, but even we were floored when after 450 students plus staff going through the line, we only looked upon 2 (two !) single serve wrappers and a wipe as trash. T H A T W A S I T ! 2 Wrappers! We, at We Future Cycle are used to a 98% reduction of waste through source separation, so something like 400 lbs down to 8 lbs, but that 8 lbs is usually a bulging kitchen size bag full of single serve chip bags, wrappers, juice pouches, snack wrap, plastic baggies and things of the sort. But 2 wrappers and a wipe were all that stared us in the face after opening the , already miniature sized bathroom type, trash can that was placed in the lunchroom. And talk about the students instantly learning what it means to put their food waste into compost and not -as before- in trash. In classroom and auditorium presentations all grades, from Pre-K through 11 were acquainted with societies biggest problem. Trash! Making recycling interesting to elementary school students is easy, all you have to do is show them a turtle that is eating a plastic bag and they are fired up to save the world. Going up the grades and it becomes increasingly difficult to make middle school and high school students excited about recycling, however they all were super interested. Learning about the foot print of Aluminium foil, or that islands 2000 miles away from the closest civilization are clogged up with garbage was an eye opener to these private scholars, that may have not had to make their own beds yet. The result was immediately visible, total buy in from the entire building population. 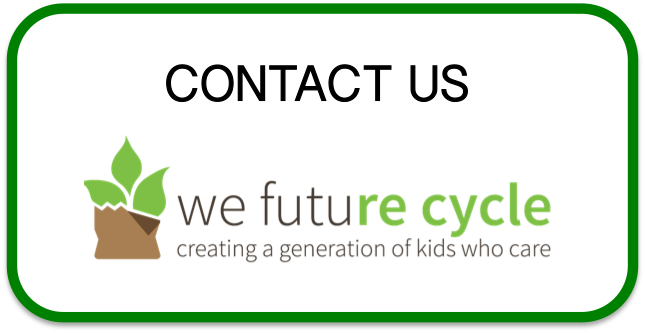 We Future Cycle is looking forward to doing a building wide audit to see how the building portion of the program works. Judging by the lunchroom, the German International School is very close to making Zero Waste a reality.